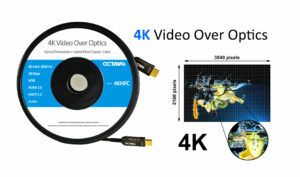 Reliable 4K Transmission on Octava 4K Hybrid Fiber Optic Cable - Video Over IP and HDMI Video Connectivity Solutions. Battling random 4K video drop outs over your bulky video cable? Check out the new compact 4KHFC 4K Video over Optic transceiver + Hybrid Fiber Copper cable. Reliable 4K Transmission – Fiber Optic is inherently high bandwidth and is immune to common EMI interference. This ensures that the video signal transmission is error free over longer distances compared to standard copper based solutions.